WHITE PLAINS, N.Y. — Rafael Nadal withdrew from the U.S. Open on Wednesday, sidelined by the knee tendinitis that has kept him out of action since his stunning loss at Wimbledon in late June. The third-ranked Spaniard reached the final at Flushing Meadows each of the past two years, winning the title in 2010 to complete a career Grand Slam, then losing to champion Novak Djokovic in 2011. “I am very sad to announce that I am not ready to play the US Open in NY. Thanks to my fans for their support and specially, the new yorkers,” Nadal wrote on his Twitter account. He hasn’t played a match since June 28, when he was upset in the second round at the All England Club by 100th-ranked Lukas Rosol. Shortly after that defeat, Nadal canceled a scheduled charity match against Djokovic in Spain, citing tendon problems in his left knee. Nadal has had recurring knee problems in the past. The 26-year-old Nadal also pulled out of the London Olympics — he won the gold medal at Beijing in 2008, and was supposed to carry Spain’s flag in the opening ceremony this time. He also opted not to play in a hard-court tuneup tournament in Cincinnati. 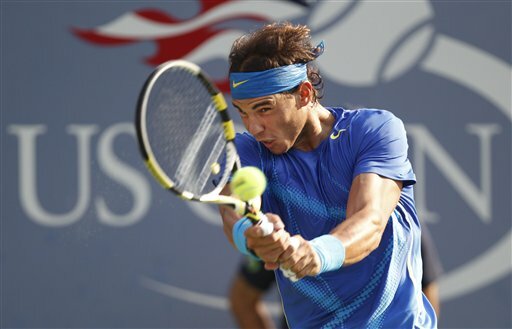 Play in the two-week tournament begins at Flushing Meadows on Aug. 27. Nadal’s absence immediately leaves a trio of heavy favorites at the last Grand Slam event of the year: defending champion Djokovic; five-time U.S. Open winner and currently top-ranked Roger Federer; and 2008 U.S. Open runner-up Andy Murray, who won the gold medal in singles at the London Games by beating Federer in the final. Nadal’s withdrawal also raises questions about his future. He owns 11 Grand Slam titles, including seven on the red clay of the French Open, but his hard-charging, hard-hitting style of play takes a toll on his body, particularly his knees. In 2009, he missed Wimbledon because of aching knees, becoming only the second men’s champion in 35 years to decline to defend his title at the All England Club. Federer, in contrast, has played in every Grand Slam tournament since the start of 2000, a streak of 51 in a row.